Warning. 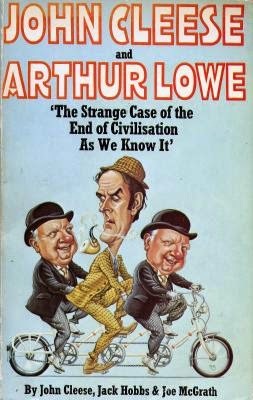 The following 56-minute movie made in 1977, Directed by Joseph McGrath, and Starring John Cleese, Arthur Lowe, with Connie Booth, is so unnerving for the viewer, I beseech you to... to... to? Errr? I don't know really? But you better beseech something. Or otherwise, you might end up doing a very silly thing. Like watching this film for instance. My God, Watson (Arthur Lowe)! Did you hear what the commissioner of police asked us to do just before you accidentally killed him whilst trying to save his life? Professor Moriarty is alive!!! And we have to track him down within five days, or else civilization as we know it will come to an end! But still, my bionic friend, are we able to actually accomplish such a task? I'm sure if I was more like my more prestigious ancestor, Sherlock Holmes, I'd be able to find this fiend post haste. Yet I'm not though, am I? I'm his pot smoking grandson instead, Arthur Holmes (John Cleese), and I have no idea whatsoever how I should instigate our investigations. Wait a minute! I've just got an amazing idea. What if we forget about all of those strange killings that are going on in New Scotland Yard, and just host a convention for likeminded detectives, so we can flush Moriarty out of the wood work? Now if this plays out in the way I hope it should, then I'm sure everything will be coming up roses. But then again, that's most probably why what next transpires all gets a mite confusing when Watson suddenly goes on a rampage. As a cross-word is full of puns - some TV detectives prey with the nuns - Mrs. Hudson (Connie Booth) has a nice set of buns - and at the end of the day, you'll only ever get to watch this film on re-runs. A friend of mine on Facebook warned me not to watch 'The Strange Case of the End of Civilization as We Know It'. He said to me, 'That's a very peculiar film. So if I was you I'd give this one a miss because it's nothing like you'd hope it would be'. But did I listen to him? No. No, I did not. 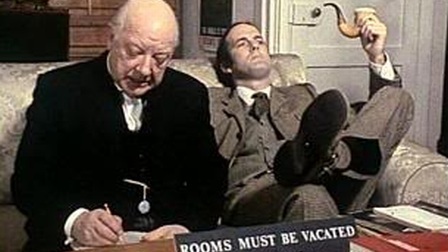 I gave this movie the benefit of the doubt because it starred two of my comedy heroes, John Cleese and Arthur Lowe, playing two of my most favorite fictional detectives ever, Sherlock Holmes and Doctor Watson. Now to put it nicely, I found this comedy had four things going against it once I eventually sat down and saw what it had on offer. Firstly, the production values on this piece were crap, to say the least, as it had that very 'seventies made of television' quality that felt rather unkempt and undernourished. Secondly, the story had a somewhat philandering approach of unraveling itself, jumping about from scene to scene to scene, with the hope that somehow we can figure out what the f*ck is going on. Thirdly, some of the jokes weren't funny at all, and just came across rather flat and stale in the execution. And fourthly, to be blatantly honest with you, dear reader, the whole bloody thing was a right let down, bar none. Well, come on, let's face it! Both visually and tonally John and Arthur could play Holmes and Watson without breaking a sweat if given half a decent script. Now I'm not quite sure what the makers of this movie were playing at by giving them such an abysmal tale. But I tell you something for nothing, it wasn't for the benefit of their respective careers. Admittedly, on a more positive note, there were some things about this film I didn't mind watching at all. Like some of the scenes between John and Arthur for instance, as they were pretty nifty despite their shabby manner. Also, I didn't mind that scene with the Sherlock pun's either, or that ploy Burt Kwouk's character suggested about doing nothing to save the day. Apart from that though, well, no. No comment. Please let us just try and forget about this car crash of a movie by checking out the following filmic-facts. (1) 'London Weekend Television' first screened this production on the exact same day 'US Voyager I' took the first photograph of the Earth and the Moon together from space. It was on the 18th of September, 1977. 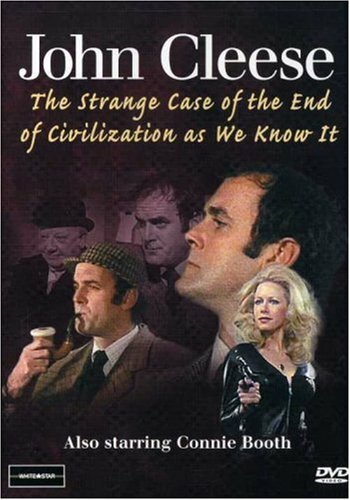 (2) Loosely translated, this project was entitled 'Oddly Enough, the End of Civilization' in Poland; and in West Germany it was called, 'Sherlock Holmes or the Strange Case of the End of Civilization'. (3) Quite a bit of this movie was shot on location throughout the English city of London. This includes 'Baker Street Underground Station', situated in Marylebone; as well as New Scotland Yard, situated in Westminster. (4) The director of this flick, Joseph McGrath, has directed such British classics as 'The Magic Christian', 'Digby, the Biggest Dog in the World', plus all of the scenes Peter Sellers was in, whilst he was making 'Casino Royale'. (5) Not only did Ivor Slaney compose the music for this movie, but he also created a number of arrangements for the 'Hammer House' series of films. (6) One year after this picture was released, 1978, two of the actors who were involved with it, Connie Booth and John Cleese, finally got what they always wanted -- a divorce. (7) Apart from co-writing this adventure with John Cleese and Joseph McGrath, Jack Hobbs also wrote the 1983 Morecambe and Wise comedy-thriller, 'Night Train to Murder'. (8) After this flick scratched its own head in bewilderment, John Cleese starred in the videoarts produced short, 'The Balance Sheet Barrier'; Arthur Lowe starred in the sitcom, 'Dad's Army'; and Connie Booth starred in the TV drama, 'Off to Philadelphia in the Morning'. Overall 'The Strange Case of the End of Civilization as We Know It' is a most peculiar film indeed. The story-line was all over the place. The comedy was of the 'hit or miss' variety. Some of the actors did a pretty fine job with what they had on hand. 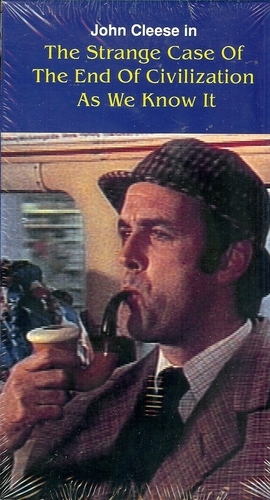 And all in all -- yeah -- this one is for die hard Sherlock Holmes and Python fans only.